It is commonly known that hockey players are the absolute best when it comes to muscling through pain. And I think my mother would approve. I’ll never forget the sight of Andrew Shaw, a gaping gash across his face, hoisting that cup last year! Now there’s a trooper! Or Keith taking a puck to the mouth, losing teeth, and then finishing the game? I can’t even come up with a sport where they’d do anything like that. Strangely enough, I have baseball to thank for this hockey cake I made. How richly ironic is that? Baseball: the sport where time stands still and the biggest threat to players are grass stains. Any readers who are baseball fans, please enlighten me as to how I can better enjoy the game. Until then, consider this an open invitation to the high-speed world of hockey, where the players move fast, hard, and even win once in a while. Several weeks ago, The Cake Boss brought a cake in to Wrigley Field to celebrate their 100th Anniversary. The cake was left out all day for the enjoyment of the fans at the ballpark, and by the end, was deemed not safe to eat (or something like that). It found its way into a dumpster, where someone took a photo, which went viral, naturally. The Cubs just can’t catch a break. 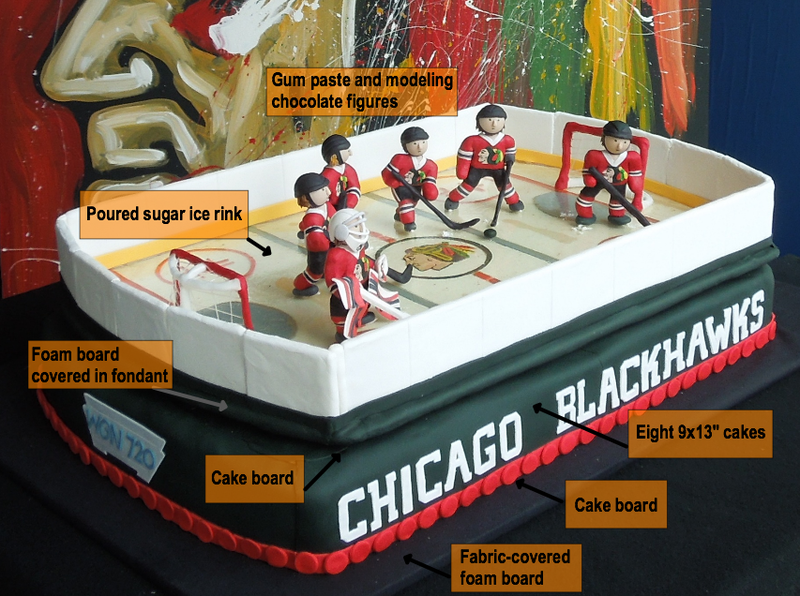 Many of my friends sent me the photo, and I jokingly commented to them that I wanted to build a hockey cake, instead! Later that evening, I heard a discussion on WGN radio where the hosts were going on and on about the cake, and about how Wrigley should have eaten it, and aren’t there any bakers in Chicago, anyways? 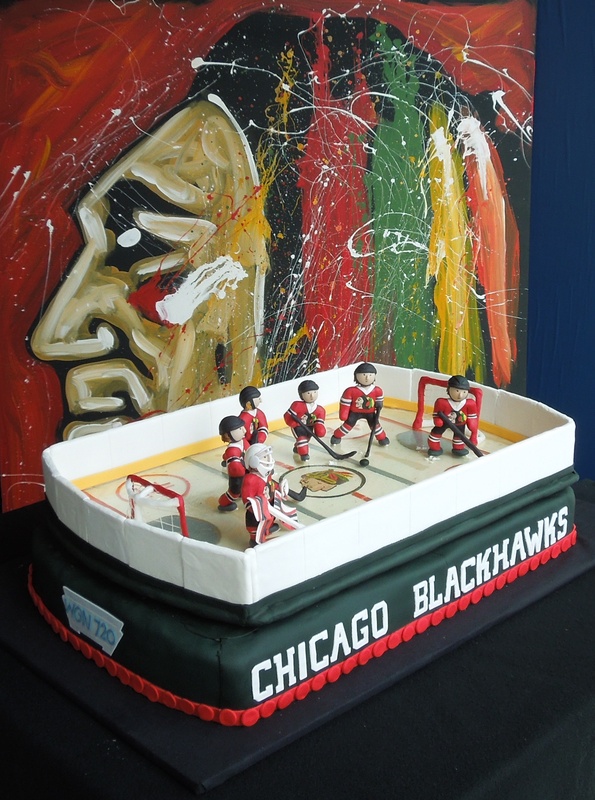 I fired off an email to the station offering to bring in a Blackhawks cake, and- wonder of wonders!- the producer was in touch with me within minutes. And then, a deep gulp: what had I gotten myself into?! With a ten-day deadline, a regular job to do, and absolutely no knowledge of large cake construction, the project seemed doomed for failure. Luckily, my family is awesome and, as usual, served as my minions. There is absolutely no way I could have done this without them. 1. Cut out foam board to a “rink” shape. 2. 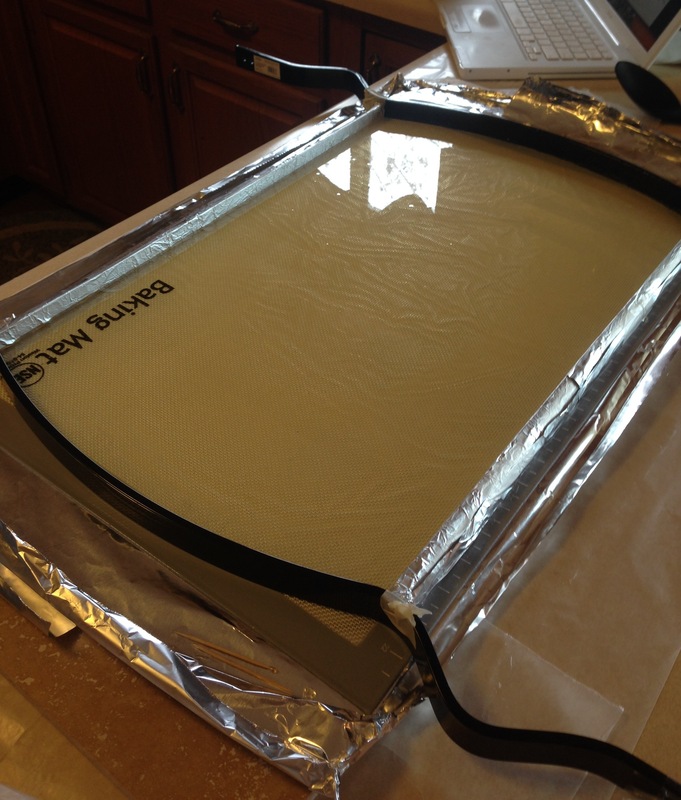 Lay fondant on the board and smooth it out (it was easier to roll it directly on the board than to try and transfer it after rolling). 3. Using a very thinly-rolled fondant, cut out various rink decorations. 4. Create center logo. Keep all these pieces like a puzzle, rather than layers. Make it as flat as possible. 5. Use a black food-safe marker to create highlights on the face and feathers. Mission: Create a clear piece of “ice” that was in the shape of a rink that can lay atop the fondant rink pictured above. I was dead-set on creating this and required it as the “wow” factor. Success rate: 8 experiments later, we came somewhat close. Result still slightly yellow-ish and bumpy, but seriously, eight tries! Enough already! Method: Cook sugar according to recipe (I used this one). Make sure you have a good candy thermometer- the temperatures listed on the device are extremely important and even a few degrees’ difference is enough to throw off the entire batch (I repeat: we did this EIGHT times). Here are three of the failed attempts. The first we cooked to the marking for “Hard Crack” (310°F). It was clear as we poured it but it turned brown about halfway through- apparently it continued cooking even when off the flame. Attempt 2 we cooked to “Hard Ball” (250°F). As you can see, it was too droopy. Attempt 3: cooked without corn syrup in an attempt to get rid of yellow tinge. Didn’t work- the corn syrup is important in getting rid of all the granules of sugar. This photo shows how cloudy it was, even after half an hour of cooking! I was so utterly lost for time that I even packed up a little kit to work on while attending my dad’s spring band concert! My last guy came to the concert as a lump of modeling chocolate, and left a player. Not easy to do by the flickering candlelight, but the deadline loomed and I was motivated by the thought of them showing an incomplete cake. Using a heavy gauge floral wire, I sculpted two hockey nets. They were then covered in white fondant. My mom, a whiz with fabrics, created the net with a bit of string. Then she covered the remaining portion of the nets with red modeling chocolate. Once the white fondant was dry, and the sugar-ice was hardened, it was time to lay it on top and see if it worked! This picture pretty clearly shows the yellow cast of the ice. Once the ice was down, it was time to create the walls of the rink. These were foam board covered in fondant and stuck into the rink using toothpicks. Unfortunately there are no photos of this part! WE’RE RUNNING OUT OF TIME!!! Here’s the most awful part about cake decorating: there are certain things that you have to do last minute. Like putting the cake together. Sure, I can make the parts in advance, but one doesn’t quite know how it will work until the actual cake is there! Luckily, my mother is an absolute angel and she baked twelve cakes while I was at work. Twelve! Once the cakes were carved and frosted, it was time to cover with fondant. I decided to cover the top with one piece, and the sides with separate pieces. If I had the luxury of hiring someone, this would be their #1 job because I am absolutely awful. Check back for my next post that will describe my experiences at WGN! I was able to bring the cake into the studio, talk on the air with Garry Meier and Tom Skilling, and leave the cake in the Showcase Studio window for passersby to see! I am so grateful to WGN for this awesome opportunity- it was a lot of fun and something that I’ll never forget! In the meantime, tune in to the podcast, available here: http://wgnradio.com/2014/05/07/garry-meier-full-05062014/ (beginning around the 3rd minute). Icing Smiles: One way you can make a difference! What a joy to read this! I love the comments about the Captain. So true! Mr. Reliable. I hope you let WGN know about the post. I would think they’d enjoy seeing it. On baseball: The game can be better appreciated once you understand the nuances. For example, pItching is truly an art as well as a science. Watch the spin on a pitch sometime. It’s amazing what some pitchers can do. And they’re throwing at 90 to 100 mph in most cases. Many play hurt. Injuries are common: smashed ankles sliding in to a base, concussions from hitting an outfield wall, or being stuck by one of those 100 mph fastballs while at bat. However, like you, hockey is the sport that I makes me cry… Not usually in sorrow but in sheer joy at what they do: Watching them carry the puck down the ice passing it back and forth at high speed, and then realizing, OMG they’re on skates! Watch their faces when they score! That’s happy. Nothing can lift one’s heart in the same way. Win or lose (yes, truly) we love you Blackhawks! Came across your cake via Pintrest. What an amazing cake. Fantastic! !